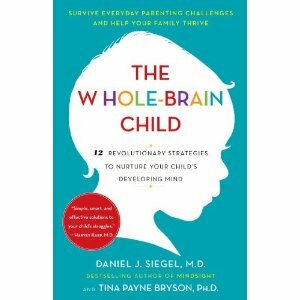 The last strategy in The Whole-Brain Child is directed at helping children navigate the conflict they will inevitably have with other children (school, siblings, etc.) by using some mindsight skills. Mindsight is “understanding our own mind as well as understanding the mind of another,” and understanding the mind of another is the focus of Strategy 12: Connection Through Conflict. So what does this look like? Well, with Elise, a 4 year old, and Maggie, a 1 year old, we are not making great leaps and strides here, but we are laying a foundation. When a toy is grabbed away, when someone is accidentally (or not) shoved, we ask Elise how she thinks a sobbing Maggie feels. Then we have Elise check on Maggie, try to hug Maggie or rub her back, and if the conflict involves a toy we try to work out sharing or trading or another compromise. We also encourage Elise to use words (not just grabbing) when they have a conflict, so that she can be a model for Maggie. And frankly, this is a daily occurrence at our house, so we are going to keep practicing and encouraging empathy in our children. As much as I would like to have conflict-free days, Siegel and Bryson say, “If [our children] are going to be in relationships, they’re going to face quarrels and disagreements,” so let’s teach them these mindsight skills. When “children develop these mindsight skills, they can learn to balance the importance of their own inner lives with those of others.” Learning to balance what you are feeling and what another person is feeling is a difficult task, so we need to start helping our children sort through conflict. I know some of these strategies sound like common sense, but honestly, they are not my first instinct. My first instinct is to stop the situation, the sooner the better, not to mediate who gets the Dora microphone first, but my kids will benefit from me taking the time to implement these strategies. They will benefit from me resisting my first instinct, taking a deep breath, and calmly teaching them how to consider one another and make the necessary repairs to their relationship. I have spent the summer months summarizing each strategy in The Whole-Brain Child, but I want you know that there is so much in this book. At the end of each strategy, the authors include illustrations that show families acting out the strategies. Then at the end of each chapter, the book provides illustrations to show how to teach the concepts about the brain to your child, and each chapter includes a section called Integrating Ourselves which is directed at us, the parents. Taking the time to read and process the Integrating Ourselves content might be difficult, but understanding your past and how it affects your relationships will help you see where you can make changes and better connect with your children. Pick up a copy of The Whole-Brain Child so you can further explore the concepts presented in the book and practice the strategies with your children. And once you’re done practicing, well, practice some more. I’m sure your children will present you with plenty of opportunities—I know mine will.